On the 4th (Fri), wander the streets of Quartier Habous. On the next day, buy something for everyone on your list at Morocco Mall, then kick back and relax at Ain Diab, and then don't miss a visit to Old Medina of Casablanca. To find other places to visit, reviews, where to stay, and other tourist information, go to the Casablanca travel itinerary creator. Cairo, Egypt to Casablanca is an approximately 8-hour flight. Traveling from Cairo to Casablanca, you'll gain 2 hours due to the time zone difference. In August, Casablanca is a bit cooler than Cairo - with highs of 31°C and lows of 24°C. Wrap up your sightseeing on the 6th (Sun) to allow time to drive to Tangier. Get a sense of the local culture at Asilah Medina and Tangier Casbah. Step off the beaten path and head to Paradise Beach Kaf Lahmam and Medina of Tangier. 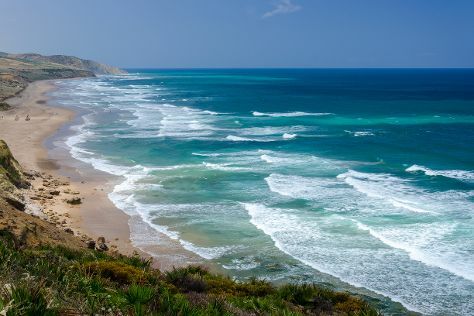 And it doesn't end there: tour the pleasant surroundings at Dalia Beach, Head underground at Hercules Cave, kick back and relax at Tangier Beach, and admire the striking features of St Andrew. For photos, more things to do, reviews, and more tourist information, you can read our Tangier trip itinerary planner. You can drive from Casablanca to Tangier in 3.5 hours. Other options are to take a train; or take a bus. August in Tangier sees daily highs of 34°C and lows of 23°C at night. Wrap up your sightseeing on the 10th (Thu) to allow time to drive to Chefchaouen. Start off your visit on the 11th (Fri): look for gifts at La Botica de la Abuela Aladdin, then stop by Local Berbere Artisanal, and then get to know the fascinating history of Chefchaouen Old City. For other places to visit, ratings, and more tourist information, you can read our Chefchaouen trip generator. Traveling by car from Tangier to Chefchaouen takes 2 hours. Alternatively, you can do a combination of train and bus. Expect a daytime high around 36°C in August, and nighttime lows around 25°C. Wrap up your sightseeing on the 11th (Fri) early enough to travel to Al Hoceima. Al Hoceima is a city in the north of Morocco, on the northern edge of the Rif Mountains and on the Mediterranean coast. Start off your visit on the 12th (Sat): stroll through Plage Thara Youssef, enjoy the sand and surf at Plage Sfiha, then explore the striking landscape of Al-Hoceima National Park, then enjoy the sand and surf at Quemado Beach, and finally enjoy the sand and surf at Plage Cala Bonita. To see ratings, more things to do, where to stay, and tourist information, you can read our Al Hoceima travel planner. You can drive from Chefchaouen to Al Hoceima in 4.5 hours. August in Al Hoceima sees daily highs of 34°C and lows of 24°C at night. Wrap up your sightseeing on the 13th (Sun) to allow time to travel to Fes. Eschew the tourist crowds and head to Meknes Medina and Jardin Jnan Sbil. 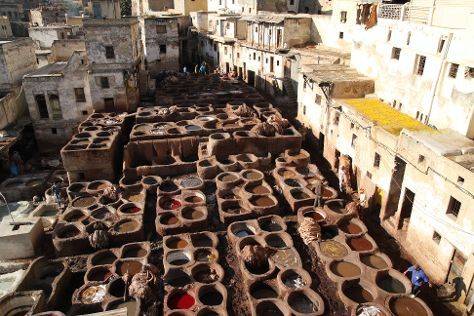 Head to Medina of Fez and Medin'Artfor some retail therapy. Step out of Fes to go to Meknes and see Mausoleum of Mouley Ismail, which is approximately 1h 25 min away. There's lots more to do: wander the streets of Fes el-Bali, stop by Coin Berbere, delve into the distant past at Volubilis, and admire the masterpieces at Nejjarine Museum of Wood Arts and Crafts. To find reviews, where to stay, photos, and tourist information, go to the Fes trip itinerary planner. Traveling by car from Al Hoceima to Fes takes 5 hours. When traveling from Al Hoceima in August, plan for a bit warmer days in Fes, with highs around 42°C, while nights are about the same with lows around 22°C. Wrap up your sightseeing on the 16th (Wed) to allow time to travel to Marrakech. You'll explore the less-touristy side of things at Cyber Park Arsat Moulay Abdeslam and Artisanat et Deco. For shopping fun, head to Marrakech Souk or Jemaa el-Fnaa. Next up on the itinerary: browse the exhibits of Jardin Majorelle, admire the landmark architecture of Bahia Palace, appreciate the extensive heritage of Menara Gardens and Pavilion, and soothe aching muscles at some of the top local wellness centers. To see photos, ratings, and tourist information, go to the Marrakech sightseeing planner. You can do a combination of flight and taxi from Fes to Marrakech in 2 hours. Alternatively, you can drive; or take a bus. Expect a daytime high around 45°C in August, and nighttime lows around 25°C. Wrap up your sightseeing by early afternoon on the 20th (Sun) to allow enough time to travel back home.